Your correspondent does a stupid human trick. Friday morning we were under a blizzard warning, so I chose to wear my L.L. Bean boots to work. Rushing to get underway, I saw a pair of the boots in the hall, and pulled them on, thinking that my wife, who had left a few minutes before, had left them there for me to find easily. I noticed that they seemed a bit snug, but didn't pay it much mind. As I walked to the subway, I felt the boots squeezing my toes, and wondered if my feet had grown since the last time I wore them. On the way home, they felt excruciatingly tight. "Damn!" I thought, "I'll have to spring for a new pair." 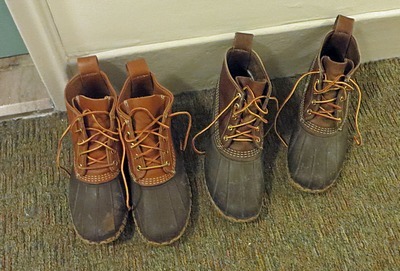 I got to our door, slipped the wet boots off in the hall, and felt welcome relief. I padded inside in my stocking feet, reached for my slippers under the bed, and, whoa!, there were my Bean boots where I usually keep them. I'd just spent an entire day wearing my wife's boots. She had decided that morning to wear her tall Hunter boots, and left the Bean boots outside the closet in her hurry. Somehow, I managed not to notice the lighter tan leather uppers on hers (see photo above). I trust I won't make that mistake again.